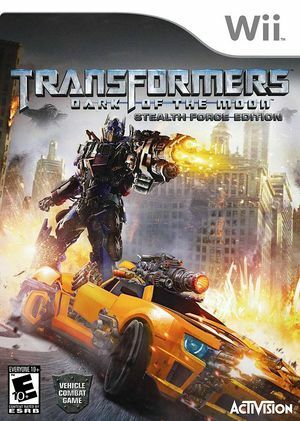 Transformers: Dark of the Moon (marketed as Transformers: Dark of the Moon - Stealth Force Edition for Nintendo products) is a third-person shooter video game. The game is a tie-in and prequel to the film of the same name. The game features a mode known as "Stealth Force" in which characters only partially transform from their vehicle mode. Weapons protrude from the vehicle form and more precise controls are available, such as strafing, airplanes also use this Stealth Force. The graph below charts the compatibility with Transformers: Dark of the Moon - Stealth Force Edition since Dolphin's 2.0 release, listing revisions only where a compatibility change occurred. This page was last edited on 13 January 2018, at 15:15.